Florida--After a four month seasonal closure to protect the spawning habitat of shallow water groupers, grouper season reopened in Florida waters Sunday, May 1. The Shallow Water Grouper Complex includes: black, red, gag and scamp grouper (along with several other less popular species). Grouper are one of the most targeted reef fish in Florida waters, and the closure came as part of the South Atlantic Fisheries Management Council?s Snapper and Grouper Management Plan. 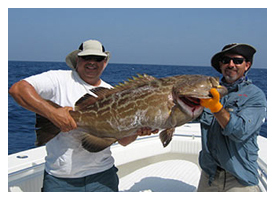 Shallow water grouper spawn off the Florida coast from January through March, when the fish congregate in large aggregations that make them susceptible to overfishing. May is historically still a good month for grouper fishing, although it is on the end of the major winter/early spring fishery. As water temperatures rise during the summer months, most grouper migrate north into Georgia and the Carolinas, although a good portion of the grouper populations moves out into deeper water where they are less targetable by hook and line anglers. This is the first of the seasonal closures recommended by the South Atlantic Fisheries Management Council, and it came on the back of tough economic times for charterboat operators in Florida waters. Rising fuel prices and severe restrictions on bottom species (grouper and snapper) have decreased booking for charter boats that regularly target reef fish for their customers. With the opening of Shallow water grouper, charterboats from Stuart to New Smyrna Beach are reporting increased bookings from regular customers ready to go reef fishing and target the species.